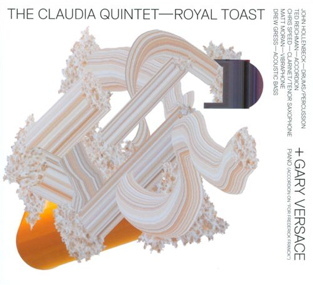 On their fifth CD, Royal Toast, The Claudia Quintet raise a glass in salute to their regal muse with a set of new music fit for a king – albeit one with more refined tastes and open mind than your average monarch. If a round table seems a wholly appropriate setting for this egalitarian ensemble (with an extra place setting this time out), theirs is as much Algonquin as Camelot, renowned for their sophisticated wit as well as their sharply-honed musical jousting. As composer/leader John Hollenbeck points out, the title might also sound a bit “silly” – but there’s something in its odd incongruity that exemplifies the band’s one-of-a-kind sound. The Claudia Quintet has similarly been finding the majestic in the mundane (or vice versa) for more than a dozen years. Nowhere is that more evident than on Royal Toast, where Hollenbeck began by collecting song titles found in often unlikely sources, divorcing them from their original context, and devising music inspired by these evocative phrases. Hollenbeck’s compositions somehow conjure raucous beauty from dizzying complexity, enticing the emotions with lilting melodies or irresistible grooves while engaging the cerebral side in a surreptitious workout. The music marries jazz, new music, post-rock – but no laundry list of influences is quite sufficient to describe their iconoclastic sound. Suffice it to say, you can feel secure bringing your hipster nephew and your math professor along to a gig, and everyone will go home happy. Of course, no one could pull off such a a trompe l’oreille without a well-honed ensemble, and the Claudia Quintet has, through intensive collaboration since their 1997 debut, developed a language all their own. The music can best – perhaps only – be defined by the individuals who create it – Hollenbeck on drums, Drew Gress (Tim Berne, Ravi Coltrane, Fred Hersch) on bass, Matt Moran (Slavic Soul Party, Mat Maneri, Ellery Eskelin) on vibraphone, Ted Reichman (Anthony Braxton, Marc Ribot, Paul Simon) on accordion, and Chris Speed (Bloodcount, Yeah No, Human Feel) on clarinet and tenor sax. As attuned as the Quintet have become to each other, they’re each remarkably attuned to themselves, as Hollenbeck discovered while recording the CD. Bridging several of the pieces on the album are short improvised interludes in which each member plays a short improvised duet with himself – unbeknownst to them until the tracks were in the can. While they sound as if each side of the mirror is reacting to the other, they were actually played separately and married after the fact. The quintet is here supplemented by pianist Gary Versace, a longtime collaborator of Hollenbeck’s (including the composer’s Large Ensemble and in the Refuge Trio along with vocalist Theo Bleckmann). The addition of Versace means that half of the band is now essentially playing percussive instruments, giving Hollenbeck more opportunity than ever to follow his polyrhythmic muse – which emerges most fully on the gleefully intricate title track. But the album begins not with force but with lush intoxication. “Crane Merit” sets an unexpectedly atmospheric mood, enveloping the listener with an idyllic warmth. Introduced by a Hollenbeck solo that gradually builds into funky propulsion, “Keramag” is the album’s toe-tappingest tune, densely wrought and utterly infectious. It and “Zurn” have the titles with the least concrete associations; the latter is a through-composed piece that generates considerable tension through an insistent drum/piano figure that is thoroughly dispelled by its ethereal finale. The album closes with the elegiac “For Frederick Franck”, an homage to the Dutch-born painter, sculptor and author who died in 2006 at the age of 97. Hollenbeck’s personal connection to the artist comes via a sculpture park in upstate New York that Franck designed and where Hollenbeck proposed to his wife. But Franck’s expansive philosophy is also representative of Hollenbeck’s boundary-blurring approach to genre. “The meaning of life is to see,” Franck espoused in his work, and the Claudia Quintet approach music with eyes wide open. This work by John Hollenbeck & the Claudia Quintet with Gary Versace was made possible with support from Chamber Music America’s 2009 New Jazz Works: Commissioning and Ensemble Development program funded through the generosity of the Doris Duke Charitable Foundation.